On Our Fresh “To Be Read” List for 2019 I decided to keep two that I mentioned (Circe, Madeline Miller and and Life L1K3, Jay Kristoff) and drop the other two books altogether. From 3 Books I’d Buy With My Birthday Money I currently have Nyxia Unleashed, Scott Reintgen checked out from the library. Here are two others I plan to read between now and the end of May. April’s Monthly Motif is Crack the Case so I really wanted to choose a killer murder mystery book to add to my list. The synopsis mentions something about the murder being Jack the Ripper-ish and I’ll admit that I’m growing tired of that take on murder mysteries. However, a ton of readers, whose opinions on books are similar to mine, have rated this fairly high. I think I’ll give it a go. One night after interviewing a reluctant witness at a London apartment complex, Lacey Flint, a young detective constable, stumbles onto a woman brutally stabbed. Within twenty-four hours a reporter receives an anonymous letter that points out alarming similarities between the murder and Jack the Ripper’s first murder—a letter that calls out Lacey by name. If it’s real, and they have a killer bent on re-creating London’s bloody past, history shows they have just five days until the next attempt. I adore the Grishaverse and Ketterdam. 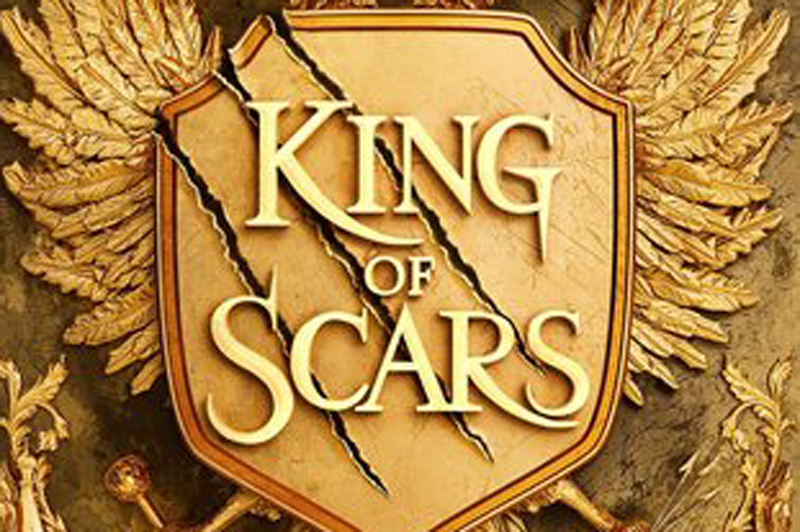 King of Scars is supposed to be a duology featuring one of Bardugo’s most beloved characters, Nikolai Lantsov. I have this on audio and I’m excited to give it a listen, hopefully over our spring break travel plans. Nikolai Lantsov has always had a gift for the impossible. No one knows what he endured in his country’s bloody civil war—and he intends to keep it that way. Now, as enemies gather at his weakened borders, the young king must find a way to refill Ravka’s coffers, forge new alliances, and stop a rising threat to the once-great Grisha Army. Yet with every day a dark magic within him grows stronger, threatening to destroy all he has built. With the help of a young monk and a legendary Grisha Squaller, Nikolai will journey to the places in Ravka where the deepest magic survives to vanquish the terrible legacy inside him. After the climate wars, a floating city is constructed in the Arctic Circle, a remarkable feat of mechanical and social engineering, complete with geothermal heating and sustainable energy. The city’s denizens have become accustomed to a roughshod new way of living, however, the city is starting to fray. When a strange new visitor arrives – a woman riding an orca, with a polar bear at her side – the city is entranced. The “orcamancer,” as she’s known, very subtly brings together four people to stage unprecedented acts of resistance. Magic marked Miles Singer for suffering the day he was born, doomed either to be enslaved to his family’s interest or to be committed to a witches’ asylum. He went to war to escape his destiny and came home a different man, but he couldn’t leave his past behind. Even after faking his own death and reinventing himself as a doctor at a cash-strapped veterans’ hospital, Miles can’t hide what he truly is. When a fatally poisoned patient exposes Miles’ healing gift and his witchmark, he must put his anonymity and freedom at risk to investigate his patient’s murder. What’s the one book you’re most looking forward to reading this Spring? Thanks for this great list!. I am really happy I came across your blog. I thought I would share a psychological thriller that I absolutely loved called “All the Broken People” by Amy Rivers (you can read more on the author’s website – http://www.amyrivers.com/). This book is fascinating in that it really puts the reader inside the heads of characters that are faced with traumatic and sometimes impossible situations and you find yourself empathizing with both the good guys and the bad guys. I can’t say a book has done that for me before. The main character, Alice, has a pretty dark childhood that she is forever trying to escape only to find that her seemingly perfect husband has a past full of secrets too. She goes to Georgie to take care of her mother-in-law who had a bad accident and finds herself and her family in a life-threatening situation. I hate to say the cliché “I couldn’t put it down” But I really couldn’t. If you check it out please let me know what you think! Happy Reading! I haven’t had time to read for a month and I’m struggling to get back on course so maybe I need a spring TBR pile to jump start me – or at least inspire me.